Andres Manuel Lopez Obrador took the oath of office as Mexico's first leftist president in over 70 years, marking a turning point in one of the world's most radical experiments in opening markets and privatisation. Mr Lopez Obrador pledged "a peaceful and orderly transition, but one that is deep and radical... because we will end the corruption and impunity that prevent Mexico's rebirth". Mexico long had a closed, state-dominated economy, but since entering the General Agreement on Trade and Tariffs in 1986, it has signed more free trade agreements than almost any other country, and privatised almost every corner of the economy except oil and electricity. Now, though, Mr Lopez Obrador talks a talk not heard in Mexico since the 1960s. He wants to build more state-owned oil refineries and encourages Mexicans to "not to buy abroad, but to produce in Mexico what we consume". He blames extreme market-oriented policies he calls neoliberalism, and in his inaugural speech to Congress said: "Mexico's crisis originated not only with the failure of the neoliberal policies applied over the last 36 years, but also in the prevalence of the filthiest corruption." 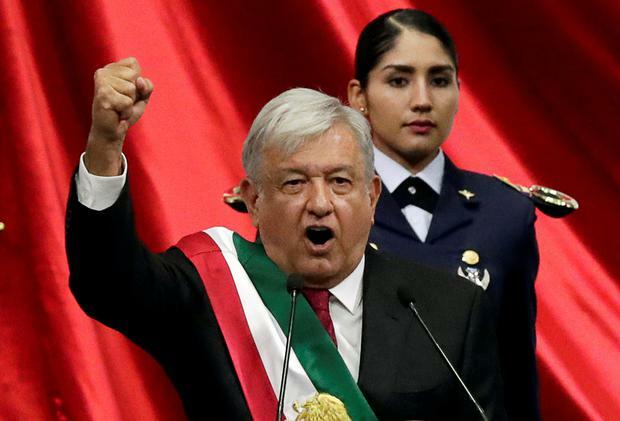 The rowdiest response came when Mr Lopez Obrador pledged "not to persecute officials of past administrations," saying "revenge is not my strong suit". Legislators responded by counting loudly to 43 - the number of students kidnapped and disappeared in September 2014 - to remind Mr Lopez Obrador of his promise to establish a truth commission to find out what happened to the students - a pledge he repeated on Saturday. Prosecutors have said they were kidnapped by corrupt police and turned over to a drug, who killed them and burned their bodies. Combined with a deep sense of nationalism and his own place in history, Mr Lopez Obrador's inauguration is the most home-grown, populist handover of power in decades. As to underscore the transition, UK Labour Party leader Jeremy Corbyn showed up for inauguration after visiting Mr Lopez Obrador a day earlier at his house in southern Mexico. A party statement said Mr Lopez Obrador "faces huge challenges in his mission of transforming Mexico, but Jeremy hopes his election will offer Mexico's poor and powerless a real voice and a break with the failures and injustices of the past". "At a time when the fake populists of the far right are gaining ground internationally - including in Latin America," the statement continued, saying Mr Lopez Obrador "has shown that a progressive agenda for change can win power and take on the status quo". Mr Lopez Obrador will hold another ceremony later on Saturday in Mexico City's main square, where a leader of Mexico's indigenous communities will bestow a traditional symbol of authority - a ceremonial wooden staff. A grand celebration featuring traditional music will be held in the square. The country's 65-year-old new leader is moving the presidential office fully back to the centuries-old National Palace that lines one side of the square, while refusing to live at the luxurious, heavily guard presidential residence six miles to the west. He will reside instead at his private home. The handover of power began at midnight when new cabinet secretaries were sworn in for key security posts - a tradition meant to ensure there is always someone at the helm of the Army, Navy and Interior Department, the country's top domestic security agency. New Interior Secretary Olga Sanchez Cordero said in a post-midnight ceremony the new government will "listen to everybody, the majority and the minorities, because in a democracy all opinions can be expressed". Mr Lopez Obrador gained prominence as a leftist politician leading protests against oil pollution in his swampy native state of Tabasco, though he has not given any indication that he will cancel private oil exploration contracts or pull out of Mexico's free trade agreements with 44 countries. Still, it is clear the first big change in direction from three decades of "neoliberal" policies of free markets and small government will occur in his six-year term. Mr Lopez Obrador won a crushing victory in the July 1 elections after two previous, unsuccessful runs for the presidency and he is the country's first president since the Mexican Revolution to rise to prominence as a protest leader. He sees his inauguration as a historic "fourth transformation" of Mexico following independence from Spain, the liberal reforms that broke the church's dominance in the 1850s and the 1910-1917 revolution. He is the most explicitly leftist president since Lazaro Cardenas left power in 1940. Mr Lopez Obrador's predecessor, Enrique Pena Nieto, leaves office with a historically low approval rating, which in several polls ranged from 20 percent to 24 percent. Mr Pena Nieto failed to rein in Mexico's rising homicide rate or deal with thousands of Central American migrants camped out on the border, leaving both intractable issues as the biggest immediate challenges facing the new leader.